The Forensic Expert Witness Association's Board of Directors selects San Francisco as the site for popular annual gathering of expert witnesses from diverse fields with a common interest in professional education. A 2015 attendee said: The line-up of speakers was spectacular. Their wealth of knowledge was staggering and their presentations were very enlightening. The setting was gorgeous AND we who attended all had a great time! The Forensic Expert Witness Association's (FEWA) Annual Conference is a national event that brings together a large and diverse group of professionals from across the country who share common goals related to forensic consulting and expert witness services in all fields of discipline. 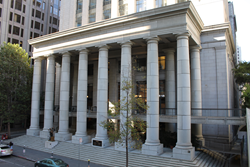 FEWA welcomes new and seasoned forensic consultants, attorneys, legal professionals, exhibitors, and those interested in exploring forensic consulting as a career to attend the 2016 Annual Conference, May 20-21 at the San Francisco Bar Association Conference Center located in the heart of San Francisco’s Financial District. The FEWA Annual Conference offers forensic consultants who often serve as expert witnesses, the opportunity to enhance their knowledge and techniques required to perform in an effective manner. Forensic experts testify in court trials or provide vital information that will be used in a trial or arbitration. Oftentimes, they must perform highly technical and precise work where one misstep can have an adverse impact on a legal case. In almost every case, attorneys rely on the expertise of the expert from initial reports to deposition to trial. The conference schedule features two days of continuing education sessions for experts and networking with attorneys, judges, arbitrators and trial consultants, plus a 1/2 day workshop for those seeking to become a forensic consultant. In addition, the conference offers attendees the opportunity to earn over 15 credit hours of Minimum Continuing Legal Education (MCLE), Continuing Professional Education (CPE) for CPAs, plus Continuing Education Credits towards FEWA’s Certified Forensic Litigation Consultant (CFLC) credential. Furthermore, the conclusion of the meeting will feature a presentation of the FEWA President's National Meritorious Service Awards. In prior years, attendees have benefited from highly regarded speakers and leaders in the field including lead attorneys, litigators, partners, judges, State Bar Presidents, law school professors, expert witnesses, and many more. The FEWA Annual Conference provides experts the opportunity to network and speak directly with professionals in an individual and interactive group-learning environment. Full two-day course registration starts at $699; one-day registration at $399. The ½ day introductory workshop for those seeking to become a forensic consultant is just $199.